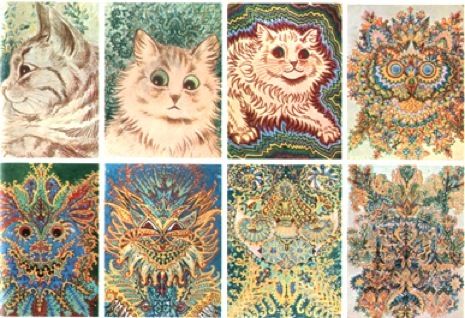 Often held up as THE classic example of a schizophrenic artist, in recent decades there has come to be greater respect for the talents of Victorian-era illustrator of anthropomorphic cats, Louis Wain. Wain’s famous felines were born of his efforts to amuse his wife as she was dying of breast cancer. Wain would draw their cat, Peter, with eyeglasses, pretending to read. This style was developed over the years and eventually Wain’s cats began to walk upright and wear contemporary clothes. They engaged in activities like smoking, fishing, playing musical instruments and having tea parties. It’s important to remember that at this time, cats were not widely kept as household pets, mostly they were kept around to eradicate vermin. Wildly popular in Victorian England, for several years Wain’s drawings and postcards were all the rage, but eventually his popularity began to… well, wane. After being taken advantage of in several investment “opportunities,” Wain’s mental health deteriorated and he was interred at a mental hospital in the poverty ward. News of his circumstances were publicized by H.G. Wells, who organized the funds to move Wain into a nicer hospital with a colony of cats, along with Prime Minister Ramsey MacDonald who personally intervened on Wain’s behalf. 1 response to "Louis Wain The Man Who Drew Cats"